Grace Mugabe is suing a Zimbabwean newspaper for $15m (£9.5m) for reporting allegations released by Wikileaks that she had made "tremendous" profits in the illicit diamond trade, according to state media. 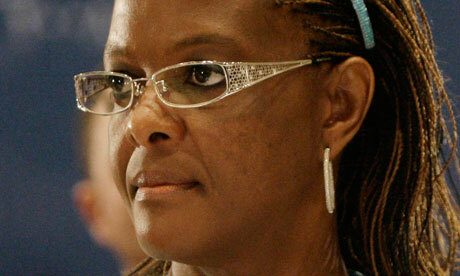 The first lady launched a defamation suit against the Standard newspaper in the high court in Harare yesterday. The offending article quoted extensively from a US embassy cable that alleged Mrs Mugabe was among a group of elite Zimbabweans making "several hundred thousand dollars a month" from the sale of illegal stones mined in the Marange district – scene of a frenzied diamond rush in recent years. The state-owned Herald newspaper said the claims made against the wife of President Robert Mugabe were "false, scandalous, malicious and bent on damaging her reputation". Court papers said the first lady, who is known for her enthusiastic shopping trips abroad, was "well regarded internationally". "Further, she is the wife of his excellency the president of Zimbabwe. The imputation of such conduct on a person of such high standing, the mother of the nation, is to lower the respect with which she is held by all right-thinking persons, to a point of disappearance." In the cable released by Wikileaks, US ambassador James McGee described a meeting between one of his political officers and the representative of a mining company that had its Chiadzwa diamond claim in the Marange district of eastern Zimbabwe revoked by the government. The mining company official was reported to have said that "well-connected elites are generating millions of dollars in personal income by hiring teams of diggers to hand-extract diamonds" from Chiadzwa, before reselling the stones to shady foreign buyers. From 2006, thousands of illegal miners swarmed to the diamond fields, among the world's richest finds in recent times, and initially sold their stones to the government. The military soon moved in, forcing people to work for them and later firing at groups of diggers from helicopter gunships in an effort to control the mining. There were also numerous reports of people close to the Mugabe government profiting greatly from the trade at the expense of the state, which was suffering grave foreign currency shortages at the time. dead after a disputed 2007 presidential election. against innocent Kenyans. They were crimes against humanity as a whole." Joshua Arap Sang, a radio personality. still innocent; we are just presenting the prosecutor's evidence,"
The court would decide by next year whether to bring formal charges. President Mwai Kibaki a year before the election. could not be reached for comment - said they were innocent. speculation and innuendo that has been peddled over the last year." unwarranted slur on my reputation and is both unfair and unjustified." Kibaki, the president, issued a statement urging caution. tribunal to address the post-election violence. realize the country's vast potential," he said in a statement. Kibaki, a Kikuyu, was declared the winner amid allegations of vote rigging. as a pillar of stability on a continent gripped by war and constant turmoil. reversing what he called "the historic land reform programme". local government Minister Igantious Chombo and Webster Shamu. putting land to maximum use. as testimony to this short-sightedness," he said. resource that should be enjoyed by all the country’s citizens. pittance of the farm profits at the end of the season." Mugabe warned such behaviour should end forthwith. "Why not work towards reaping the entire profits for one’s family? He challenged Zimbabweans to explore areas of economic empowerment. would commit to their chosen field. hesitation — that for the next 10 years coal is where all the money will be. I asked myself how many of our own people have this knowledge? into such enterprises?" Mugabe said. to be ready to make a positive difference in the country’s economy. you on the areas you should direct your economic endeavours," Mugabe said. may be ours but do you believe in yourself truly as you should be?" he said. its participation in the Sadc brokered political arrangement. serving other masters who are not the people of this country. against sanctions, we could not get the level of commitment we hoped for,"
Charter on non interference in the domestic affairs of another country. building-block of the country," Mugabe said. Committee report and reviewed the party’s activities in the last 12 months. effect an illegal regime change. backing to hold a general election in mid-2011. Tsvangirai in a unity government. He has called for elections by June. constitutional review is needed first. Tsvangirai defeated Mugabe in the parallel presidential vote. constitution and an election commission had been set up. resolved the disputed presidential election first." election he wants to be held by mid-year. 2008 following a 2005 vote. have held power since independence from Britain in 1980.
officially been removed from the US targeted sanctions list. among a group of 17 people removed from US sanctions lists around the globe. Dabwenga’s daughter, Ijeoma, was also removed from the Zimbabwe list. League chairperson. She is now chairperson of the ZAPU council of elders. the Tsholotsho Declaration, was described by Mugabe as a coup attempt. saw six provincial chairpersons expelled from ZANU PF. the West, with the measures being blamed for the country’s destruction. ‘concessions’, until the targeted measures are dropped. superpowers are beginning to relax their attitude towards ZANU PF. in one ear and out the other, and rightly so,” Makumbe said. people still on the list can’t go shopping in 2011,” Makumbe said. takeover of businessman Mutumwa Mawere’s Shabanie and Mashava mines. Minister is forced to appear before the portfolio committee,"
or how they would force Chinamasa to do anything. provided by the state to support them. reputation for dealing with investors. Chinamasa misled the nation about the facts. to prepare for the cross-examination. that he would not be coming. over the Zim documentation project. process less than ten thousand passports in recent weeks. “sabotage and deliberate” on the part of the Zimbabwean government. documents as the cut off date for regularising their documents. will now be able to use the receipts to submit applications for permits. the process since its commencement in September. approval of 27 000 and rejection of 10 000 applicants. Those pending determination stand at about 79 000.
people anxiously waiting for their fate in South Africa. the largest chunk is housed by South Africa. opportunity before the expiration of the deadline. also been extended to them. A steady rain made the wait particularly miserable for Zimbabwean immigrants crowded outside a South African immigration office, trying to legalise their status before a feared wave of deportations. As many as 3 million Zimbabweans are believed to be living and working in South Africa after fleeing entwined economic collapse and a political crisis in their homeland. South African authorities, who had allowed many to stay without even passports, announced the crackdown in September, saying that those who did not apply for legal status before December 31 would have to go home. That has led to crowds at immigration offices across South Africa on Wednesday, with some Zimbabweans lining up for several days before even getting in the door to apply for work or study permits. Human rights groups complained that four months was insufficient and that bureaucrats in Zimbabwe and South Africa were unprepared for the large numbers of applicants. “Just being legal, it would change my life. I would be more comfortable,” said Frank Nkathazo, a 37-year-old gardener who was waiting to submit his application Wednesday with little hope of reaching the doors before they closed at 4 p.m.
Zimbabweans make up the largest immigrant group in South Africa. Rights groups say legalising Zimbabweans would ensure they pay taxes and that their children go to school so that they can grow up to contribute to the economy of their adopted country, echoing arguments in immigration debates in the United States and Europe. The decision to document Zimbabweans is “very worthwhile”, said Kaajal Ramjathan-Keogh of the Johannesburg offices of Lawyers for Human Rights, but she stressed that the deadline should be extended. Immigration minister Nkosazana Dlamini-Zuma said deportations would not start until all applications are processed, acknowledging that could take some time. Speaking to reporters on Tuesday, she said she could not say when deportations would begin. In early 2009, South Africa announced Zimbabweans could travel here on a free 90-day visitor's permit and apply to do casual work during their stay. It was the end of that “special dispensation” that was announced in September, with South African officials citing improved economic and political conditions in Zimbabwe. Nkathazo, the gardener from Plumtree in western Zimbabwe, stood under his umbrella outside a handsome concrete and brick office tower on the edge of downtown Johannesburg, clutching a purple plastic folder stuffed with his new passport and a letter from his employer. He even brought a South African ID card he had lied to obtain years ago. South African authorities have said those who obtained South African identity documents illegally will get amnesty if they return them. To qualify, applicants must prove they have been in South Africa since at least May this year. Nkathazo has been here 15 years, and the ease with which he has regularly ferried between his wife and four children in Zimbabwe and his job in South Africa demonstrates how just how porous the border is. Ahead of Nkathazo a woman sat wrapped in a blanket, huddling under an umbrella on a concrete stump planted at the entrance to the building to keep cars from parking too close. Entrepreneurs sold brightly coloured plastic envelopes to keep precious documents dry. Business was brisk for the envelopes and for umbrellas as rush hour traffic splashed by. Bryan Khumalo, a 27-year-old computer consultant, said he had lined up for four days to apply in September, and last week received a cell phone text message informing him he had been granted a work permit. He arrived at 4 a.m. Wednesday, but was still 87th in line. Experience had taught him only 50 or 60 people make it inside on any day, and he was resigned to returning. Youth Wing calls for the arrest of Zimbabwe’s JOC (Joint Military Command). some war veterans and the Zanu (PF) militia for human rights abuses. Air Zimbabwe and Zimbabwe Broadcasting Corporation. credentials to President Jacob Zuma. credentials of ambassadors who had been “unilaterally” appointed by Mugabe. Community, has remained mired in disagreements. the togetherness of the government,” said Chamisa. countries to present their letters of appointment to Zuma. and understanding the importance,” said Kodwa. letters to Zuma would be before the state of the nation address next year. from the same book. Zanu-PF talks white and acts black,” said Chamisa. recovery, Labour Minister Paurina Mpariwa said on Wednesday. country where unemployment is estimated at anything above 90 percent. Tsvangirai and President Robert Mugabe. keeping money in banks where it would instantly lose value. by 5.7 percent the previous year. imported textile goods cuts deep. Company being the biggest causalities. sectors to accelerate economic growth to more than nine percent next year. may call elections in 2011.
voters roll cleanup will not work if the entire process is not computerized. thus are ineligible to vote. matter of great concern in a country with so many young people. But he added that an up-to-date and transparent voters roll is critical. the reign of President Robert Mugabe and his party. Mnagagwa who told people in Kwekwe his home town that he was taught to kill. next week. (He is the source of the story and is now with Zanu (PF). festival venue at the Biscuiterie. since the festival started on December 10.
community and media on 1 December,” she said. festival which ends on December 31. It is with great pleasure that I welcome you to this press conference which comes after day-long deliberations by the national executive committee and the national council of the MDC. Let me say at the outset that the MDC is a people-centred party and the people are always at the core of our business and deliberations. We are the true repository of the people’s aspirations and we have a duty to make a public announcement when we take far-reaching decisions in the interest of the people of Zimbabwe. We have remained resolute, in the full knowledge that we are the true people’s representatives because of the clear mandate given to us in a legitimate election. Today’s meeting of the national council is the last meeting of the year; a tumultuous year in which we have experienced both progress and frustrations in our quest to bring about real change to the people of Zimbabwe. It is a year in which evidence abounds that our participation in government has added value and improved the lives of the people. But it is also a year in which we have recorded frustrations as a result of stagnation in the resolution of the outstanding issues of the GPA and President Robert Mugabe’s unilateral and unconstitutional acts. These frustrations have slowed the pace of democratic reforms, which are the core business of the inclusive government if we are to prepare conditions conductive for a free and fair election as spelt out in the GPA. However, these frustrations have not dampened our spirits, but have instead spurred us to continue with our collective journey of hope towards a new Zimbabwe and a new beginning. The question of elections and the country’s state of preparedness. a. Council noted the provisions of Article 5.2.2 of the Party’s Constitution with regards to the holding of a Congress and therefore directs that the Party Congress shall be held by the 30th of May 2011.
b. Council further waives strict compliance with the time limits provided in the Constitution. a. Council notes the problems of legitimacy, violence and infringement and assault of the constitution-making process. b. The party further notes the derailment of the peoples’ will in this process. c. Be that as it may, Council directs that the current constitution making process must be concluded and a referendum must be held. Toxic issues including the issue of violence, deployment, of security agents in the countryside and a corrosive media. c. Council expresses its regret at the failure to execute the 24 agreed issues and now calls on the Principals of the parties to take measures to implement and execute the agreed positions as reflected in the Negotiators report dated the 3rd of April 2010 and more importantly, to enforce and uphold the Implementation Matrix as agreed by the Principals on the 8th of June 2010.
a. Council notes and restates the position that an election in Zimbabwe should be held to deal with the question of illegitimacy associated with the farcial Presidential run-off election of June 2008.
b. For the avoidance of doubt, Council resolves that the next election should be solely for the disputed Presidential election of 2008 with a harmonised election to be held in 2013 as prescribed in the Constitution. c. Further, Council restates that Zanu PF nor its President do not have the right of unilaterally calling for the aforesaid Presidential election and that Article 23.1.b of the GPA and the 8th Schedule of the Constitution which requires agreement, should be respected. Guarantees with respect to the honouring of the peoples’ will,and urge that the same be put in place before the aforesaid elections. Council notes the suffering of the Zimbabwean people and the attempts of the Inclusive Government to mitigate the aforesaid suffering. However, Council notes the leakages, corruption, opaqueness and lack of accountability associated particularly with minerals and extractive industries in general. ii. Urges the immediate crafting of the Diamond Act that will legalise the above issue and create the National Sovereign Fund. i. Council notes the existence of thousands of ghost workers in government who are affecting government capacity to remunerate the genuine civil servant. ii. Council therefore urges the immediate publication and execution of the long awaited public service audit. Council therefore calls on the withdrawal of all deployed security personnel in the countryside. Council calls on the Organ on National Healing, Reconciliation and Integration to speed up the process of national healing to abate any forms of political violence. Council calls on the International Criminal Court to name and prosecute all perpetrators of post election violence in Kenya. Further, Council calls on the Attorney General and the Judiciary to prosecute all perpetrators of violence. Furthermore, Council calls on the South African Government to release the South African Judges Report into electoral violence of 2002 and the South African Generals’ Report of the 2008 electoral violence. Council applauds the people of Ivory Coast for voting peacefully. Council notes the defiance and lack of respect of democracy and the will of the people by losing candidate Laurent Gbagbo in failing to relinquish power tantamount to a military coup. Council applauds ECOWAS and the AU in their efforts to finding sustainable peaceful solutions in Ivory Coast. Further, Council calls on Mr. Laurent Gbagbo to respect the will of the people, the election results and concede state power to Mr. Alassane Quattara and his political party to allow for stability and growth in the West African country. Council notes attempts to divide the party and cause division in the Party by Zanu PF and state agencies. Council also notes the continuation of this agenda through various channels including diplomatic leaks now known as WikiLeaks. Council therefore condemns the aforesaid attempts to divide us and indeed the reports in the aforesaid WikiLeaks. Council restates the strength of the party and reaffirms that the party cannot be divided or de-branded by the loony actions of a dying Zanu PF empire. is the only one with a coalition government in the sub-region. ultimately be what we mean by development” (infed.org, accessed 15/12/10). Some may ask, “What are you talking about? Are we not already liberated? process of widening people’s choices and improving their well-being. are: a long and healthy life, knowledge and a decent standard of living. Additional concerns include ‘social and political freedoms’ (Ibid). continue to divide our interconnected world. individuals accountable for their actions which impact on good governance. there is no question of treason as if one is dealing with an enemy state. their representatives is a sell-out. Not at all. enemy while advancing through or withdrawing from an area (wikipedia.org). lie idle in the name of indigenisation. they study the high political temperature prevailing in the country. sitting on a time bomb. POSA laws which have resulted in human rights abuses. it, why can’t we do it? the EU, UN, AU and SADC will soon be invited to ensure a legitimate outcome. attract investment. Exiles would most likely flock home with jubilation. Even targeted sanctions would become unnecessary. errors in nation building and development where necessary.